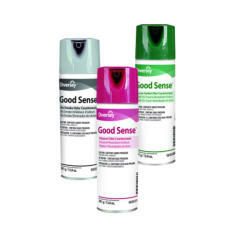 Good Sense® Instant Air Fresheners Fast-acting, instant air fresheners that leave a pleasant scent. Aerosols are CFC-free. Available in three attractive scents: Tuscan GardenTM/MC, Potpourri and No SmokeTM/MC. SKUs 5035288 and 5035317 are colorless with a floral scent. SKU 5035325 is colorless with a spice scent. 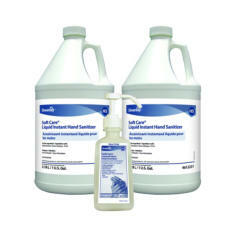 Soft Care® Liquid Instant Hand Sanitizer Alcohol formula for use primarily by healthcare personnel. Just apply to clean hands and let dry. Thoroughly sanitizes without drying skin. Proven to be mild even after repeated use. Colorless with no scent. Fast-acting, instant odor counteractants that help neutralize odors from tobacco, food, mold, mildew, urine and vomit. Effective for use on carpets, hard surfaces and in the air. SKUs 04345 and 04969 are pale yellow in color with a green apple scent. SKU 05388 is pale yellow in color with a spice scent. SKUs 05394 and 3165353 are yellow in color with a fresh scent.